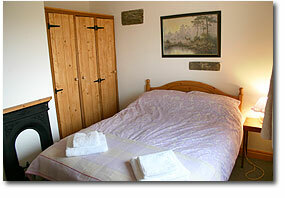 Very comfortably furnished, each self catering cottage is cosy and compact. Being on one level they are suitable for the elderly and disabled. 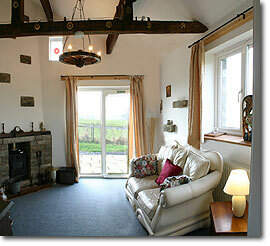 They have been built with character with exposed beams and a woodburning stove in the lounge. Both cottages have stunning views across open countryside from the comfortable lounges which have french windows leading onto the patio area. The lounges are equipped with Colour T.V. and D.V.D. player. The spacious kitchen/dining area has Gas cooker, fridge with freezer compartment, and Microwave. Each is equipped with a four seater dining table and ample storage. The cottages water supply is from our own hill side spring. 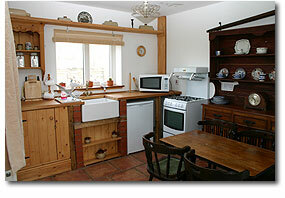 Both cottages have Oil fired central heating throughout (central heating and electricity is included in the rent). Logs are also available for the woodburning stove for an extra charge. Each cottage has one double bedroom and one bedroom with child-sized bunk beds 2' 6' x 5' 9'). The double bedroom also has a dressing table and fitted pine wardrobe. The fully fitted bathroom in each cottage includes bath, shower, basin and W.C. There is a private patio and sheltered seating area for each cottage, as well as a large shared lawn area with views over open fields. For the cyclist there is a lockable dry storage area for cycles and panniers plus drying area for wet weather gear. Each cottage has ample parking.